Burma’s pro-democracy leader Aung San Suu Kyi has issued a personal appeal to all concerned parties to review the ongoing dam projects in Kachin State, the main one being the 6,000-megawatt Myitsone dam which is being built at the source of the Irrawaddy River. “Ecological change to the Irrawaddy would impact all those whose lives are linked to the great river, from the ethnic peoples in the northernmost state of our country to the rice-growing communities of the delta,” Suu Kyi wrote in a statement released on Thursday. “To conserve the Irrawaddy is to protect our economy and our environment, as well as to safeguard our cultural heritage,” she added. Dam construction on the Irrawaddy—often referred to as the “lifeline” of the country, because it flows through several of Burma's main cities— is being facilitated by the Burmese government and financed by China’s state-owned China Power Investment Corporation (CPI). However, the project has become a major talking point among Burmese in recent weeks as criticism by environmental rights groups mounts. Environmentalists say the megadam project will cause serious social and environmental problems, and will directly affect people living both upstream and also far downstream, even as far away as the Irrawaddy delta and the coastal areas of Burma. In May 2007, the Burmese military regime and CPI signed an agreement to build seven large dams in Kachin State by 2017. Upon completion, the project will have capacity to produce approximately 13,360-MW of electricity annually—which will not be for local consumption; it will be transferred to Yunnan Province to feed China’s expanding energy needs. Meanwhile, an environmental impact assessment, fully funded by CPI and conducted by a team of Burmese and Chinese scientists—but which was obtained by Thailand-based Burma Rivers Network—said that the dams will threaten the biodiversity of the local ecosystem, as well as impacting millions of people who depend on the Irrawaddy River for their livelihoods. The megadam project in Kachin State is deeply unpopular among the general population. Local communities in project areas have opposed the dams, not just because of their displacement, environmental impact and threats to cultural sites, but also because the site is located less than 100 kilometers from a major fault line, posing a risk to basin inhabitants should an earthquake weaken the dam structure or cause landslides in the reservoir. 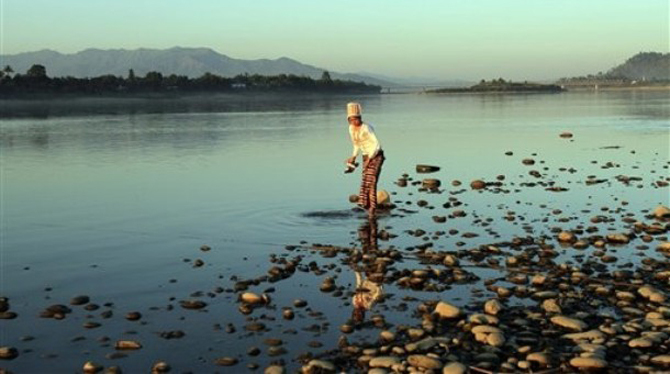 “If the Irrawaddy Myitsone Dam were to break during an earthquake, it would endanger the lives of hundreds of thousands of people by flooding Kachin State’s largest city, Myitkyina,” noted Burma Rivers Network on its website. The Myitsone Dam is being constructed at the confluence of the Mali and N’Mai rivers. It is the largest among the seven dams, and is expected to produce 3,600 to 6,000 MW of electricity annually. When finished, it will be the 15th-largest hydroelectric power station in the world. Under contract to the CPI in partnership with Burma's Electricity Ministry of Electric Power-1 and private firm AsiaWorld, the dam will create a reservoir the size of New York. In July, Chinese Ministry of Foreign Affairs spokesman Hong Lei said that "cooperation between China and Myanmar [Burma] is on the basis of mutual equality, and is in the interest of both countries' development and both countries' people." The spokesman added that China pays close attention to ecological protection and requires Chinese companies operating outside its borders to obey local environmental and other laws. The Burmese state media, in response to critical articles such as Aung Din's "Killing the Irrawaddy" has maintained that the project will have no negative impact on the flow of the Irrawaddy, nor on the lives and livelihoods of the local population.